Love it or hate it, cold brew coffee has never been more popular, and the category shows no signs of slowing down. From an ever-growing number of ready-to-drink beverages to nitro-infused and draft options, it’s an increasingly crowded marketplace. Although there’s no denying the demand, compared to espresso and filter coffee, cold brew presents its own unique challenges. 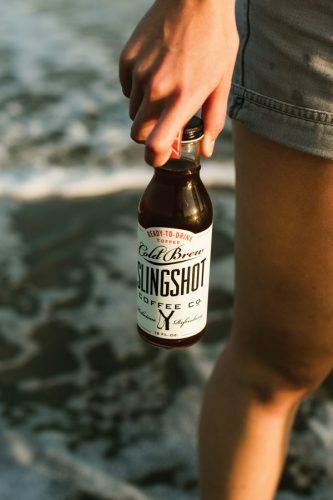 But with the right strategy, cold brew can help drive profits in the notoriously slower summer months, and even touch on a new customer base. 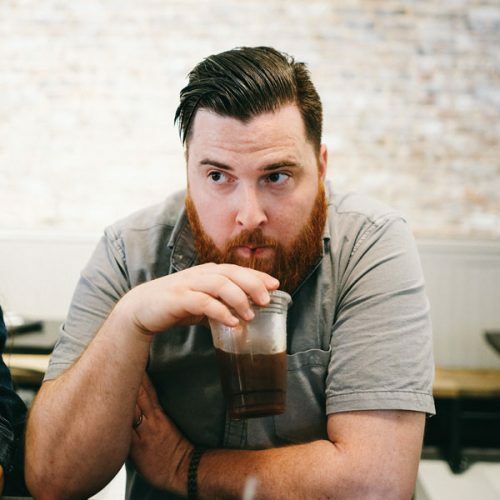 “Carbonated soft drinks and energy drinks are on the decline, and cold brew not only tastes great but also sits at the confluence of so many macro trends,” says Hugh Duffie, cofounder of Sandows, a London-based bottled cold brew company. As cold brew continues its move toward peak market saturation, cafés will need to differentiate their offerings. In Bonchak’s experience, many cafés struggle to serve a consistent product because they fail to implement the same quality control protocols they might use for other beverages. Making cold brew is often assigned as a closing duty, and hastily executed by a barista trying to get out the door. “It’s our job to make sure we’re providing the best quality that we can,” she says. Bonchak observes that many quality-focused cafés elect to carry a ready-to-drink option rather than make their own. This might be motivated by a lack of infrastructure or the convenience of having a consistent, high-quality product. 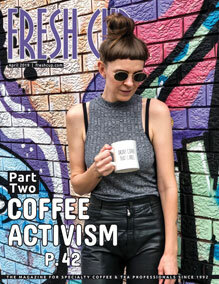 “To make enough cold brew to service a relatively popular café, you need a lot of space to do that,” she says. There’s also the matter of scale. Sandows utilizes a light pasteurization to ensure sanitation and lengthen shelf life. He recommends cafés that make their own cold brew be careful not to keep a batch of cold brew too long. For many cafés, especially roaster/retailers, selling a bottled cold brew makes less business sense than making their own. Stevenson warns that cold brew has long steep times, and underestimating demand can be a costly mistake. As a general rule, it’s better to have some waste than run out during the day. 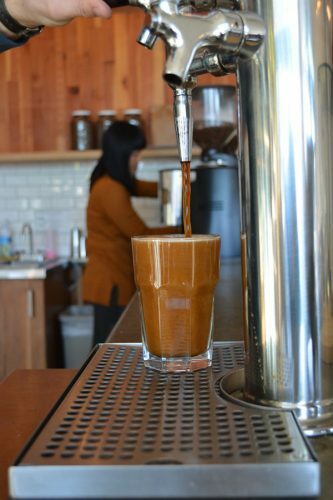 Cafés that decide to brew their own cold brew will have to pick a method. Slow-drip towers, often called Kyoto brewers, are eye-catching, elegant devices that have a flavor profile preferred by many coffee professionals. With glass beakers and nozzles, the systems require careful handling and take up a lot of counter space. While certainly a conversation-starter, the high price tag makes this cold brew method a luxury for many cafés. 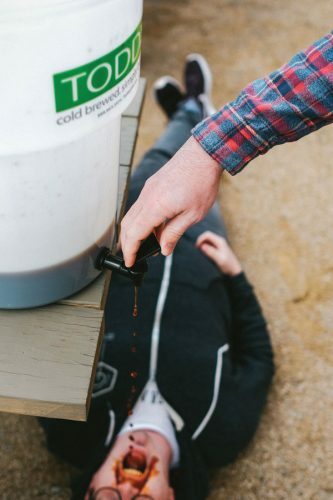 There’s nothing glamorous about brewing cold brew in what’s essentially a large bucket, but the affordability and durability of the Toddy system makes it the preferred method for cafés on a budget. For larger-scale brewing, some cafés have rigged their own systems by modifying fermentation tanks normally used for brewing beer and wine. Immersion cold brew methods usually are used to make a concentrate, which can be cut anywhere between 20–40 percent of the water required. 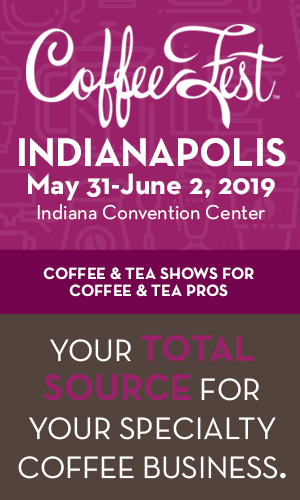 Offering cold brew on draft or infused with nitrogen can be another way to add value for customers and set apart one’s offering, but each café must decide whether it’s worth the equipment costs of installing a keg system. 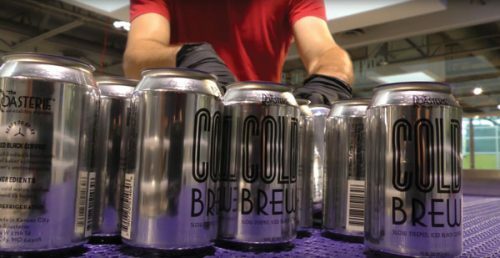 “Nitrogen is flavorless on its own and doesn’t react with the coffee, so it only adds a frothy head to the coffee,” explains Steve Rhinehart of Prima Coffee, which sells keg and refrigeration units for cold brew. Rhinehart has seen an increase in demand for both cold brew on draft and on nitrogen. 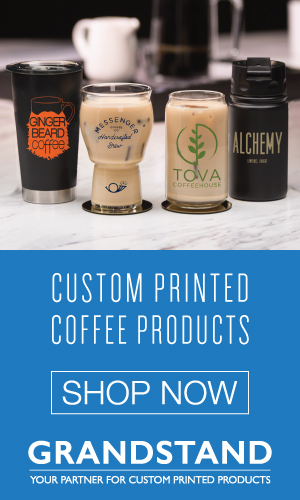 “Because of the extra surface area of the bubbles on top of the coffee, it could enhance the aromatic qualities of the cold brew, but I find most people just enjoy having a creamy foam on their coffee,” he says. Cafés that want to maximize their cold brew program must not only ensure that their product is excellent, but also appropriately priced. Cold brew is significantly less efficient than other brew methods, with some recipes calling for more than twice the amount of ground coffee than SCA Golden Cup ratios. The higher cost of goods associated with cold brew might tempt a café to cut costs elsewhere. 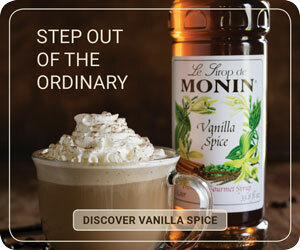 It’s not uncommon for shops to use stale coffee or source a cheaper blend to use for cold brew. According to Bonchak, café managers might want to rethink these kinds of cost-cutting strategies. “It’s never a good idea to use a stale coffee for cold brew,” she says. Try this Cold Brew Short Rib Recipe.